I have subscriptions for the things that I enjoy such as cloth diapers, magazines and makeup. Heck They even have subscriptions for your dogs and medication, so why not get subscriptions for your kids? Austin Lloyd provides subscription boxes for children that are hand picked for different age groups, ranging from infancy to 3 years! You can sign up to have new and unique toys and books delivered right to your door with a one month, 3 month or 6 month subscription package. 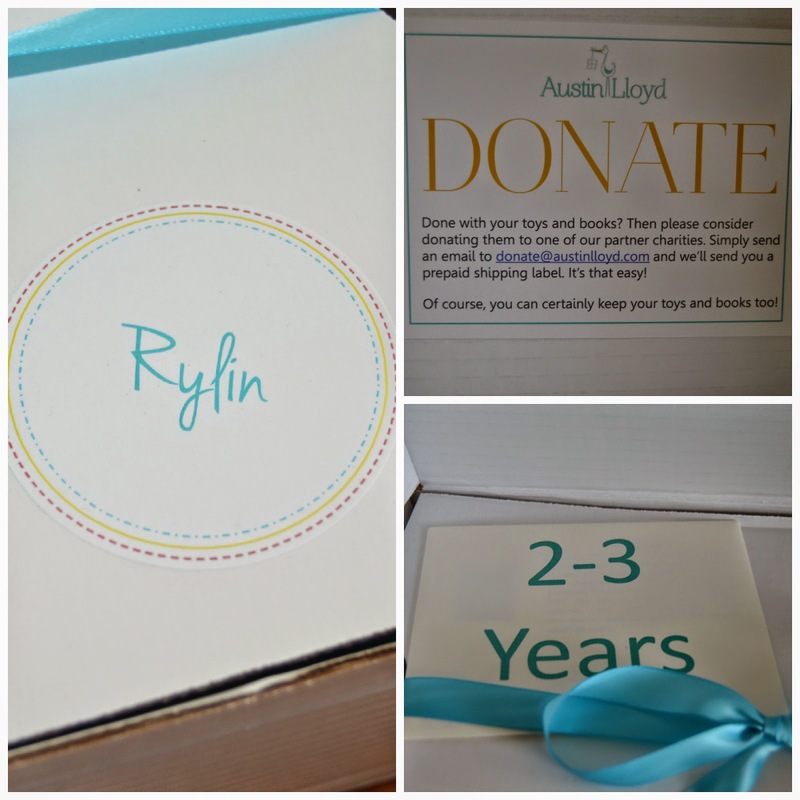 You can even send an Austin Lloyd box as a gift to another little boy or girl! Each box has 4-5 engaging and age appropriate goodies to help build fine motor and cognitive skills, and to add a cherry to the top of this toy cake - there will not ever be a battery operated item in the box! The toys are bpa and phthalate free and you will not find them at most stores, so keep reading to get the inside scoop! Another great thing about Austin Lloyd is their passion for giving to those less fortunate. If there are items in your box that will go unused, or when your child outgrows them, you can send them back and Austin Lloyd will donate them to one of their partner charitable organizations. They will even cover the shipping! Just place the items in your Austin Lloyd box, shoot them an email and print the provided label! We received the September box, which was Air and Space themed. In it were 4 toys and one book. Rocket To The Moon is a book about a boy who builds a rocket to "go to the moon". Along his building journey he learns a little bit about space and the gear that astronauts use, and he gets home from the moon just in time for a snack! Even my 6 year old has enjoyed this book at bedtime! The Shuttle With Fuel Truck is a wooden toy with magnetic piece. Take the adventure from the floor to space with this miniature space shuttle, and remember that you can't leave Earth's atmosphere without rockets. The rockets are ready and waiting for your next adventure on the fuel truck! Rylin was instantly drawn to the red Mini Airplane. It is made of plastic, but very lightweight and easy to hold with free spinning wheels. Build a Helicopter is my personal favorite of the bunch! Hector, our Helicopter's name, is just too cute! He is wooden and comes apart into 4 large pieces. He is easy enough to take apart that little hands can do it, but not so easy that he just falls apart during play. I don't know about you, but my kids love to color on everything but the paper. The Star Crayon is a bathtub crayon that is safe to use on the tub, bath tile and even themselves. It is easy to wash off, and has all 6 colors conveniently located on only one chunky piece. No more looking for those little nubs floating towards the drain after bath time is over! Of course, this was a huge hit with all three of my kids, and I'm pretty certain that they have worn all of the colors completely out! I'll also add that my 3 year old used this to color on her bed, on the sink and all over the toilet. It washed out easily! One last thing that I really liked about Austin Lloyd is that they customize your package. I just enjoy those personal touches that bring companies a notch above the rest. Inside of the box was an envelope with the age range that we had requested. In that envelope are little cards describing each toy and showing you the retail values of each item as well. Also, when you first open the box you see a little blurb about donating and a sticker with your child's name on it. Follow them on Pinterest, and of course, Tweet them!